When you look at the #mindfulness hashtag on Instagram, you would think mindfulness is impossibly fit yoga instructors or effortlessly designed bohemian bedrooms. Mindfulness, however, is much more than a wellness trend. Mindfulness is most impactful when it inhabits the daily, mundane, and stressful spaces that limit our ability to process and respond to our emotions. At DMF Youth, we’re spreading mindfulness to a new generation– shifting how our students process life’s stressors. There’s mounting evidence that meditation and mindfulness can effectively replace disciplinary punishment, resulting in fewer school suspensions and detentions. According to Newsweek, this trend is particularly needed for students of color as “K-12 black students are nearly four times more likely to be suspended than white students, and black students are also nearly twice as likely to be expelled as are white students.” There is no evidence that removing kids from the classroom through expulsions and detentions are effective. At DMF Youth, we’re using our innovative combination of fitness and Social Emotional learning to weave mindfulness principles into our curriculum. 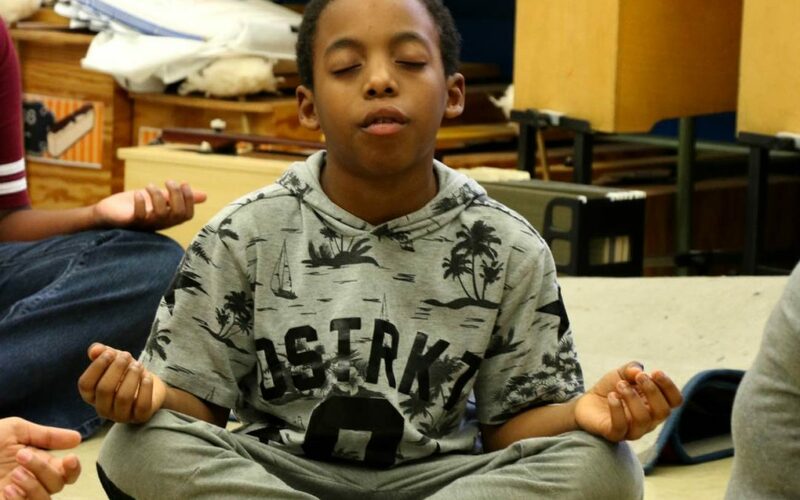 By teaching meditation as an alternative coping method to anger and aggression, we’re helping build resiliency and emotional awareness in all the children that attend DMF Youth. Our kids are learning how to resolve issues peacefully using meditation and mindfulness. Help us continue to provide at-risk youth with free afterschool fitness programming that grows their social and emotional wellbeing– make a donation now!